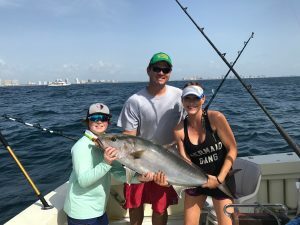 The south Florida summer dolphin are here, but catching them has been hit-or-miss for Lady Pamela sportfishing. When we find them though the catches have been really good. Sharks continue to thrill, right in line with Shark Week on TV. We have caught some lemons and a few smaller hammerheads, but also some bull sharks. 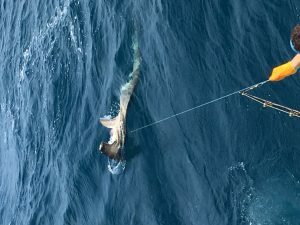 I am making the bull shark (Carcharhinus leucas) the Lady Pamela II sportfishing’s fish-of-the week both because we are catching them, but also because they were in the news last week. It seems a swimmer at Haulover Beach, just south of the Fort Lauderdale/Hollywood area, was bitten by what was reported to be 4-5-foot bull shark. What is most noteworthy is that the attack took place off the “clothing optional” part of the beach. Need I say more? Apparently, the male swimmer was only bitten on the legs, with other exposed “appendages” spared. That being said, the swimmer was lucky, as bull sharks can be quite aggressive, and are considered by many to be the most dangerous of all sharks to humans. There is no doubt they are aggressive, because when they attack one of our baits, they go full tilt. We rarely lose a hookup on bull sharks because they so viciously attack the bait. Some of the bulls around here can go nearly 500 lbs. 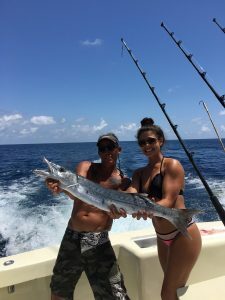 In other action, we are catching some big barracudas and amberjacks on the shipwrecks. 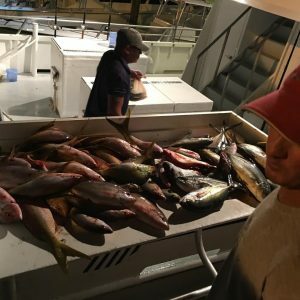 On the driftboat Lois Ann, the mangrove and yellowtail snapper fishing has been phenomenal. The nighttime drift trips have been popular because it is not quite so hot out.